Two Batteries - With Henry Cordless Two Battery you can use one, charge one, so he’s always ready to go. Powerful Cordless Cleaning - Powerful cleaning for a quick clean-up to the whole house. 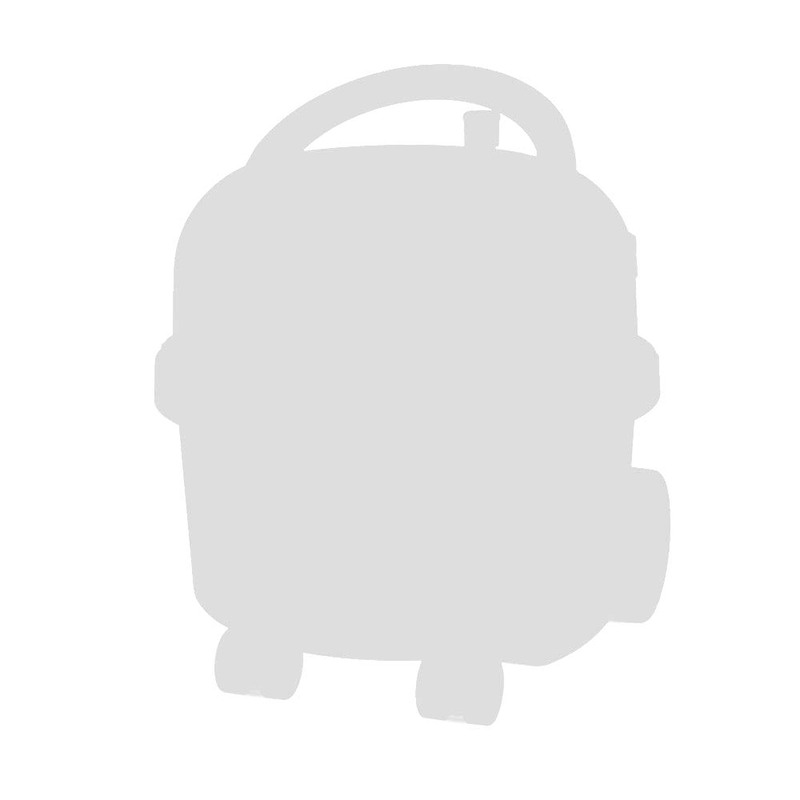 Huge Capacity - Less emptying with a capacity up to x10 bigger than many cordless vacuums. Long Runtime - Enough battery power for the whole house. 60min x2 Battery. Quick Charge - Recharge in 3.5hrs. With 2 Battery Henry use one, charge one with charging station. Power Boost - Switch up to Hi mode for the more demanding clean-ups. Emptying with No Dust and No Mess - Henry’s innovative self-seal tab locks all the dust in the bag meaning emptying with no dust and no mess. Cordless cleaning and convenience from the U.K’s most popular cylinder vacuum. Powerful cleaning for a quick clean-up to the whole house. Less emptying with a capacity up to x10 bigger than many cordless vacuums. Enough battery power for the whole house. 30min Single Battery / 60min x2 Battery. Recharge in 3.5 hrs. With 2 Battery Henry use one, charge one with charging station. Switch up to Hi mode for the more demanding clean-ups. Less emptying with a capacity up to x10 bigger than many other cordless vacuums. Cordless and capable, Henry Cordless is ready for the house cleans, quick clean-ups and the car… again and again with no stopping to empty. Enough battery power for the whole house. With a 30 minute runtime, Henry’s ready for the house clean and more. The advantage of a cordless cylinder means the weight is where it should be… on the floor. Henry Cordless Two Battery extends runtime to 60 minutes, with the added bonus of use-one-charge-one. Recharged and ready to go in 3.5 hours. Henry’s charging station allows charging where it’s convenient. 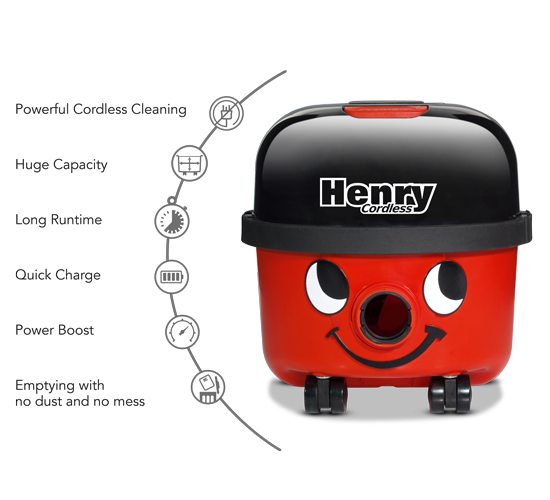 With Henry Cordless Two Battery you can use one, charge one so he’s always ready to go. 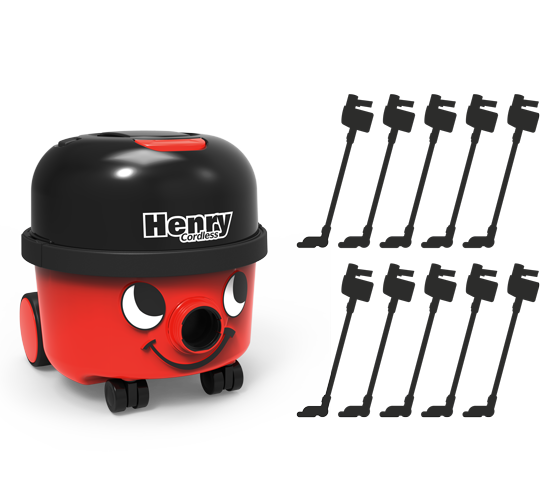 Carpets, hard-floors, cars, stairs, DIY… nothing beats a Henry for versatility. Henry Cordless comes with the same accessory kit as Henry Original. Quality accessories for the toughest Pro cleaning and made to last. No other cordless is better equipped for cleaning out the family car. No plugs, no extensions just quick cleaning. Long 2.4m flexible hose reaches under seats and across the car, crevice tool for narrow gaps, sides of seats, storage areas etc, compact stiff upholstery brush, perfect for coarse carpets and a soft dusting brush is ideal for dashboards and displays. Switch to boost mode and Henry delivers powerful cleaning just when you need it. With Henry Cordless you’ll have the convenience of cordless with the power you need. Henry’s reliability and simplicity has always been a large part of his appeal to the 10 million owners. Henry Cordless is no different, his power boost switch and battery status display are simple and straight-forward. With a wide cleaning track and combination floor tool Henry Cordless is perfect for both carpets and hard-floors. Quickly and effortlessly remove cobwebs and dust. With Henry Cordless the weight of the battery is on the floor not in your hand meaning no reaching or straining. Attach any of the accessories to the long 2.4m flexible hose for detail and difficult to access cleaning.